The piano at my home has three pedals, and the one at the right is brighter and shinier than the other two. What has happened? Is it normal? Obviously a grand piano, with sostenuto in the middle. Since the damper pedal is the most used on just about every piano (practice pedal on some gets used a lot but will be locked down), it appears that this damper pedal is a replacement for the original, which may have been damaged in transit rather than 'worn out'. It's not, unfortunately, a good match to the others, but I think we can rule out lots of use, as that would only cause part of the pedal to be different. We don't slide our sole over the whole pedal. As long as it works, it's not a problem - although adjustment on damper pedals on some grands can be a nightmare - balancing the no-damper position with the damper on position. If the piano is worth a fair bit, I'd be inclined to find a matching pedal. It has worn differently - the damper pedal is used the most. 3 is ruled out by the uniformly different appearance including areas of the pedal that aren't in contact with the foot, leaving 1 or 2. The other pedals are in a shocking way. Presumably this piano has suffered a long period of disuse. 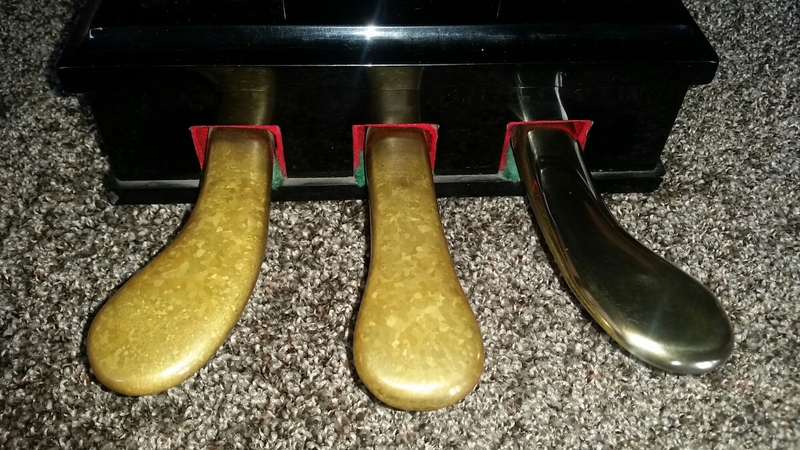 Your piano technician should be able to buff the discolored pedals to match the shiny repaired/replaced damper pedal. Why he or she didn't do that while repairing/replacing the pedal is puzzling. Not the answer you're looking for? Browse other questions tagged piano instruments keyboard keyboard-pedals instrument-cleaning or ask your own question. Whose idea was it to put three pedals on a piano? What is the standard location of piano pedals? Is there a lightweight keyboard piano that doesn't require any energy supply? How could I use a loop pedal with the Yamaha YDP-160 electric piano? Why do some acoustic upright pianos have 2 pedals, but not 3? Left and right hand playing same note on piano, or can I ignore it? What do the pedals on grand pianos do?